Je pensais qu'il n'y avait plus grand chose à dire sur ce qui s'était passé entre le 16 décembre 1944 et fin janvier 1945 à Thirimont mais, suite à une question, je me suis rappelé d'un acte de grande bravoure qui mérite d'être souligné et que peu d'habitants de Thirimont connaissent. En réexaminant les informations disponibles sur Francis S. CURREY, j'ai trouvé pas mal de documents intéressants sur YOUTUBE mais aussi sur un site où l'on a eu l'excellente idée d'interviewer ce soldat avant que son témoignage ne disparaisse avec lui. 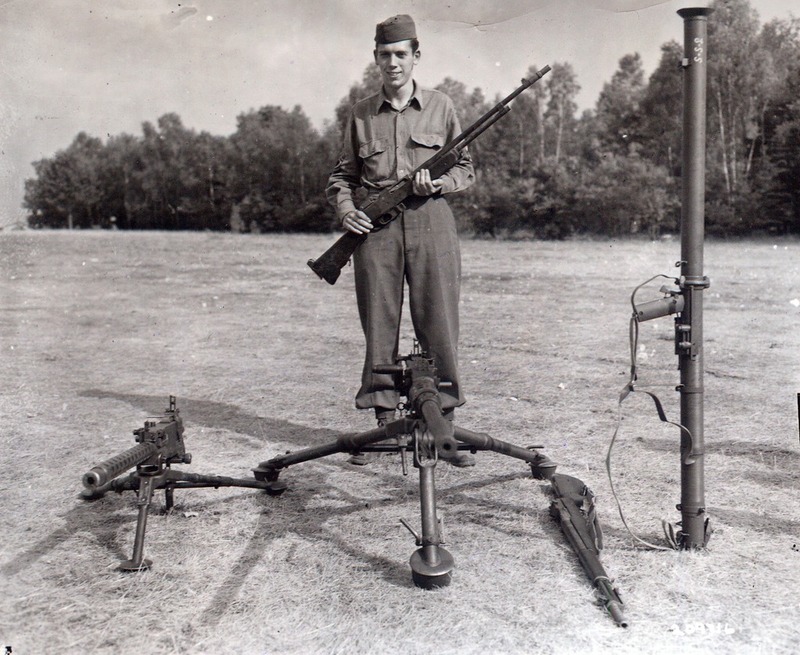 Rank and organization: Sergeant, U.S. Army, Company K, 120th Infantry, 30th Infantry Division. 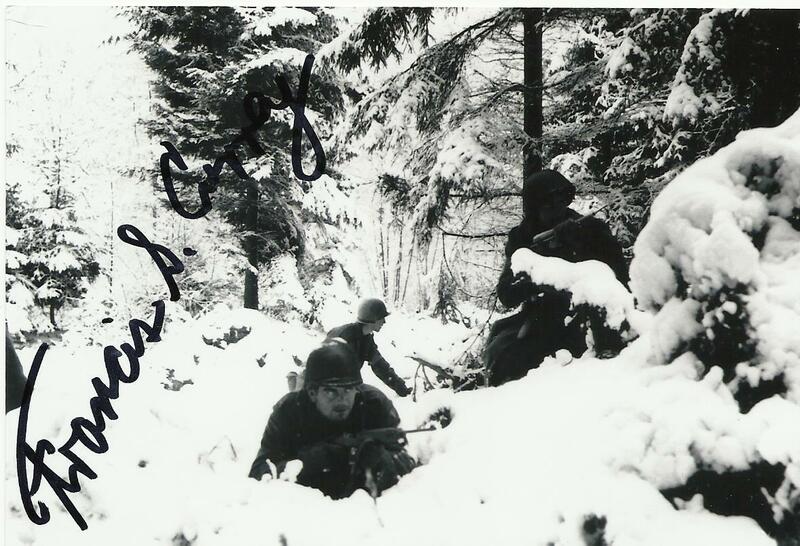 Place and date: Malmedy, Belgium, 21 December 1944. Entered service at: Hurleyville, N.Y. Birth: Loch Sheldrake, N.Y. G.O. No. : 69, 17 August 1945. He was an automatic rifleman with the 3d Platoon defending a strong point near Malmedy (THIRIMONT) , Belgium, on 21 December 1944, when the enemy launched a powerful attack. Overrunning tank destroyers and antitank guns located near the strong point, German tanks advanced to the 3d Platoon's position, and, after prolonged fighting, forced the withdrawal of this group to a nearby factory. Sgt. 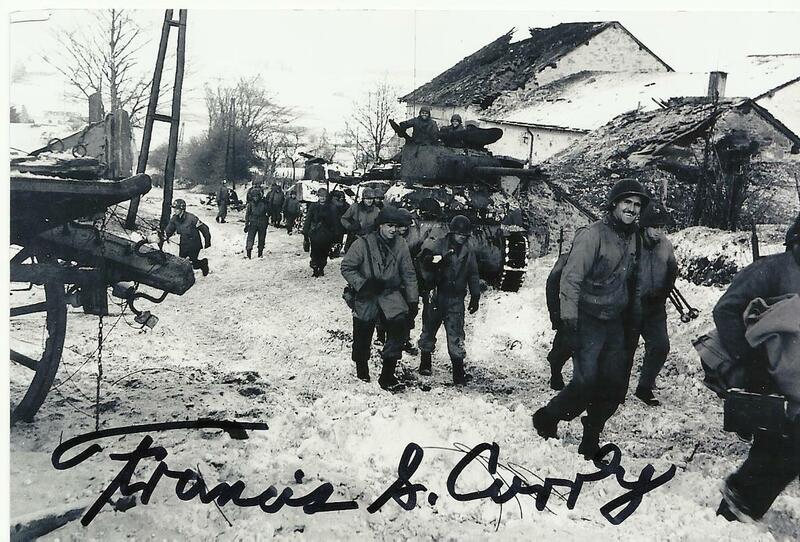 Currey found a bazooka in the building and crossed the street to secure rockets meanwhile enduring intense fire from enemy tanks and hostile infantrymen who had taken up a position at a house a short distance away. In the face of small-arms, machinegun, and artillery fire, he, with a companion, knocked out a tank with 1 shot. Moving to another position, he observed 3 Germans in the doorway of an enemy-held house. He killed or wounded all 3 with his automatic rifle. He emerged from cover and advanced alone to within 50 yards of the house, intent on wrecking it with rockets. Covered by friendly fire, he stood erect, and fired a shot which knocked down half of 1 wall. While in this forward position, he observed 5 Americans who had been pinned down for hours by fire from the house and 3 tanks. Realizing that they could not escape until the enemy tank and infantry guns had been silenced, Sgt. Currey crossed the street to a vehicle, where he procured an armful of antitank grenades. These he launched while under heavy enemy fire, driving the tankmen from the vehicles into the house. He then climbed onto a half-track in full view of the Germans and fired a machinegun at the house. Once again changing his position, he manned another machinegun whose crew had been killed; under his covering fire the 5 soldiers were able to retire to safety. Deprived of tanks and with heavy infantry casualties, the enemy was forced to withdraw. Through his extensive knowledge of weapons and by his heroic and repeated braving of murderous enemy fire, Sgt. Currey was greatly responsible for inflicting heavy losses in men and material on the enemy, for rescuing 5 comrades, 2 of whom were wounded, and for stemming an attack which threatened to flank his battalion's position. Fusilier du 3e peloton défendant un point d’appui à Thirimont (près de Malmedy) en Belgique, le 21 décembre 1944, alors que l'ennemi lançait une puissante attaque, détruisant des chars destroyers et des canons antichars U.S. situés à proximité d’un point d’appui, les chars allemands ont avancés sur la position tenue par le 3e peloton , et après d’intenses combats, ont forcés le retrait de ce 3e Peloton vers une grange voisine. Le Sgt. Currey y a trouvé un bazooka et a traversé la rue pour s’emparer des roquettes sous un feu intense des chars et des fantassins ennemis qui avaient pris une position dans une maison proche des évènements. Faisant face à des tirs de petit calibres, de mitrailleuses et d'artillerie, avec un compagnon, il a mis hors de combat un char par un tir de bazooka. Passant à un autre poste, il a observé 3 Allemands se trouvant sur la porte d'une maison ennemie. Il les a tués, ou mis hors de combat, avec son fusil automatique. Il est sorti de sa position et, avançant à découvert à moins de 50 mètres de la maison, avec l'intention de la détruire à l’aide de roquettes. Couvert par un feu ami, il se dressa et tira un coup de bazooka qui fit tomber la moitié d'un mur. Dans cette position avancée, il remarqua 5 Américains qui avaient été cloués au sol durant des heures par le feu de la maison et de 3 chars. Se rendant compte qu'ils ne pouvaient pas s'échapper avant que le char ennemi et les canons d'infanterie n'aient été réduits au silence, le sergent Sgt. Currey traversa la rue vers un véhicule U.S. où il s’empara de nombreuses grenades antichars. Il les tira sous le feu nourri ennemi, obligeant les servants du char à se réfugier dans la maison. Il grimpa ensuite sur un Half-track sous le feu ennemi et a tira à la mitrailleuse vers la maison. Une fois de plus, il a changea de position, il s’empara d’une autre mitrailleuse dont les servants avaient été tués. Sous son feu de couverture, les 5 soldats U.S. purent se retirer en sécurité. Privé de chars et avec de lourdes pertes d'infanterie, l'ennemi fut forcé de se retirer. The Medal of Honor is the United States of America's highest military honor, awarded for personal acts of valor above and beyond the call of duty. The medal is awarded by the President of the United States in the name of the U.S. Congress to U.S. military personnel only. There are three versions of the medal, one for the Army, one for the Navy, and one for the Air Force Personnel of the Marine Corps and Coast Guard receive the Navy version. 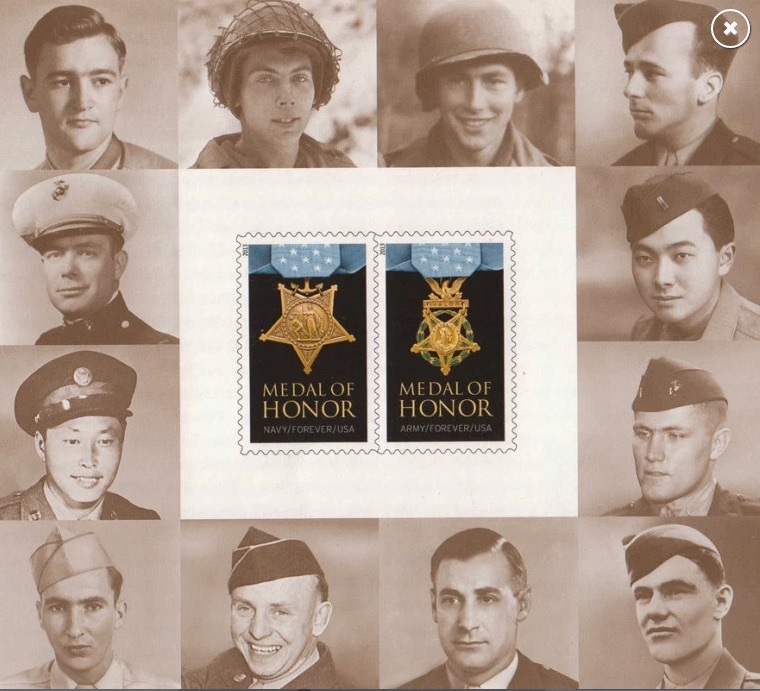 It is sometimes known by its initials "MH", but the initials are not used by recipients as a post-nominal title.The Medal of Honor was created as a Navy version in 1861 named the "Medal of Valor",and an Army version of the medal named the "Medal of Honor" was established in 1862 to give recognition to men who distinguished themselves "conspicuously by gallantry and intrepidity" in combat with an enemy of the United States. Because the medal is presented "in the name of Congress", it is incorrectly referred to as the "Congressional Medal of Honor". 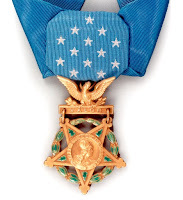 The official name is "Medal of Honor", which began with the U.S. Army's version. 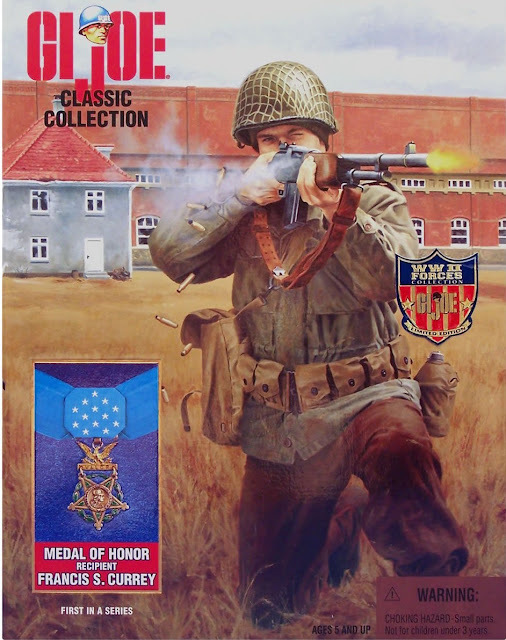 Within United States Code the medal is referred to as the "Medal of Honor", and less frequently as "Congressional Medal of Honor".The Medal of Honor is usually presented by the President in a formal ceremony at the White House, intended to represent the gratitude of the American people, with posthumous presentations made to the primary next of kin. According to the Medal of Honor Historical Society of the United States, there have been 3,515 Medals of Honor awarded to the nation's soldiers, sailors, airmen, Marines, and Coast Guardsmen since the decoration's creation, with just less than half of them awarded for actions during the four years of the American Civil War.In 1990, Congress designated March 25 annually as "National Medal of Honor Day". 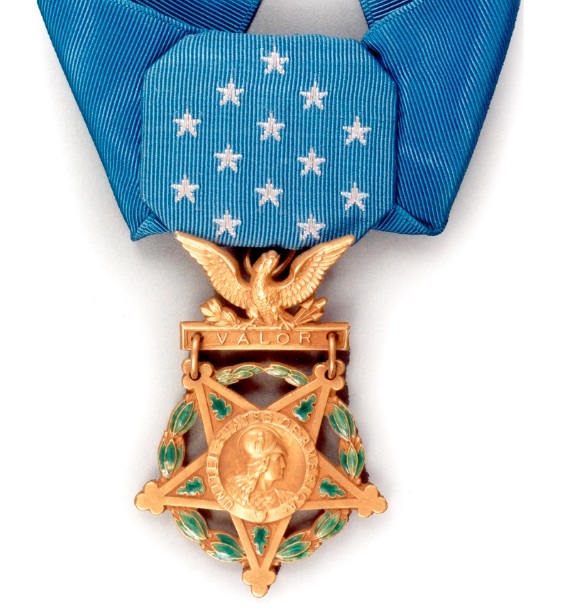 Due to its prestige and status, the Medal of Honor is afforded special protection under U.S. law against any unauthorized adornment, sale, or manufacture, which includes any associated ribbon or badge. Le 17 décembre 1944, des unités du Kampfgruppe de Peiper massacrent 84 prisonniers de guerre américains au carrefour de Baugnez, non loin de Malmedy. Le massacre de Baugnez n'est pas un acte isolé. Avant celui-ci, à Honsfeld, des éléments de son groupe tuent de sang-froid plusieurs dizaines de prisonniers américains. Un autre massacre de prisonniers de guerre américains est rapporté à Bullange. Les soldats allemands se trouvant sur l'itinéraire de pénétration de la troupe de Peiper avaient probablement pour rôle de laisser libre un couloir d'alimentation en munitions et en carburant au profit des troupes de Peiper. La découverte des personnes tuées par les hommes de Peiper (ou les troupes les accompagnant) ne s'est faite que vers la mi-janvier 1945 donc Francis S. Currey et ses amis n'en savaient rien au moment des faits, ni lors de la seconde attaque (tres destructive) de Thirimont qui se passa vers la mi janvier 45.
including Francis Currey (top row, second from left). In early December, 1944, the 30th Infantry Division was in a more-or-less static combat situation, with much aggressive patrolling going on, probing into the German defenses in the vicinity of Langweiler, Germany, just a little bit north of Aachen. It was bitter cold, rainy and muddy, and the forward progress was very slow. We were still waiting for the build-up of supplies, to enable us to make the crossing of the Roer River as soon as possible, and to then be able to continue on. All supplies up to this point were being brought to us from Omaha Beach – 450 miles to the west, so it was a slow process of bringing up adequate supplies, and replacements, to keep a Division in a static position, and yet build up a reserve for future action. In the meanwhile, all of our Battalions not on line, were being sent back to Kerkrade, Holland, to our Rest Center, an ancient monastery by the name of Rolduc. Each battalion rotated at this time, each one for 5-6 days, so everyone had an opportunity to get some badly needed rest, showers, clean clothes and limited entertainment, as well as good hot meals, and to enjoy hot coffee and donuts supplied by the American Red Cross girls. Upon returning to the front lines again, each Company received intensive training in tank / infantry tactics, learning how best to coordinate and communicate with each other, in preparation for the big assault that was to come “momentarily”. This continued on a daily basis, until Sunday, 17 December 1944. About noon, the entire Division was placed on ‘alert’, and was to be ready to move out on a moment’s notice. An unusual way to announce the beginning of a proposed assault across the Roer River, we thought, but we soon found out that the assault by our Division had been called off. Unknown to us at this time, 1800 hours, the German Army had struck the day before, (16th), in a least likely area in the mountains of the Ardennes in Belgium. This particular defensive line, from Bastogne northward to Malmedy, was held by the newly arrived, and “green” 106th Infantry Division, and the 99th Infantry Division. The rationale being, that this would be a god place for them to get their initial exposure to combat experience, through patrolling and coming in very limited contact with enemy patrols, and further, no one in their right mind, would mount an attack of any consequence, in a mountainous area in the middle of the winter. It would be too confining to the narrow and winding roads, which would be a prime necessity for attacking troops, and to maintain their supply lines and any traffic across the mountains and through heavy woods, which would impede vehicles and troops. Guess What?? That is right where they mounted their attack!! It must be mentioned here, that the 106th and 99th Infantry Divisions were stretched out over 85 miles of a defensive position, with little or nothing to their rear as reserve troops. They were stretched out there all by themselves!! A big mis-calculation by SHAEF Headquarters, and Damned poor U.S. Intelligence! They had been adequately advised of unusual activity to the front, but it was dismissed as “rumor”, “hallucination” and a few other reasons to downplay any reports of activity to the front. How wrong they were at SHAEF, in their evaluation of these reports! Their plan was to break through, capture some supply and fuel dumps of the 1st Army, then race on to Liege, thence to Antwerp, which had recently been cleared and made operational, thereby shortening our supply line from Omaha Beach. This would ha e effectively cut off the entire Canadian Army, the entire British Army and the U.S. 9th Army. Hopefully, this would allow the Germans to sue for separate peace treaties with each of these Armies, enabling them to end the war in the West, and allow them to devote their full attention to the war in the East against the Russians. At about 1000 hours the night of December 17th, our 30th Infantry Division was ordered to move out – to where, no one seemed to know. Just follow the vehicle ahead of you! Soon, we were able to realize, by orienting on the stars above, that we were moving South, but to where or why, was still a big question. “The 30thInfantry Division, the elite Roosevelt’s S/S Troops and Butchers, are enroute from Aachen to Spa and Malmedy, Belgium, to try to save the 1st Army Headquarters, which is trying to retreat from the area, before they are captured by our nice young German boys. You guys of the 30th Division might as well give up now, unless you want to join your comrades of the 1st Army Hq. in a P.O.W. Camp. We have already captured most of the 106th Division, and have already taken St. Vith and Malmedy, and the next will be Liege”. We were stunned, as only then did we have any clue as to where we were going, or the reason for this sudden movement. We arrived at the prescribed destination on the afternoon of the 18th of December, and light defensive positions had already been established all around. Malmedy had Not been taken, as Axis Sally had said, and we found that Malmedy had been our objective destination. Malmedy was in our defensive sector, but St. Vith was not, being just south of our sector. However, St. Vith had been captured by the Germans. Prior to our arrival in Malmedy, it had been hurriedly occupied by the 291st Engineer Combat Battalion, which had hastily erected road blocks on the most strategic roads and approaches to the town. Col. Joachim Peiper was the commander of the 1st S/S Regiment, of the 1st S/S Panzer Division, the spearhead which was to attack Malmedy. Due to the many defensive road blocks established by the 291st Engr. Bn.,, and the 120th Regiment, Peiper was unable to get into Malmedy, and then he opted to skirt the area to the south, and make a dash for Stavelot & Stoumont by “back-roads”. The main incentive for this routing, was to reach our 1st Army fuel depot at Stavelot, where there was over 1 million gallons of gasoline. Had they attained their goal, we could not have stopped them, and they would have been on their merry way to Liege and Antwerp. There were no reserve troops in this area to block his advance. Enroute through this area, Peiper met up with Company “A” of the 285th Field Artillery Observation Battalion, composed of about 140 men in over 30 vehicles, that were passing across the front of Peiper’s advance at Baugnez, commonly known as Five Points, as they were enroute to St. Vith. Needless to say, they were all captured and herded into an adjacent field, lined up, and methodically machine gunned down. Following this, some of the German soldiers walked through the mass of bodies, and any that were moving or groaning, were shot in the head. Thus, this became the noted “Malmedy Massacre”. This was not the only isolated incident of this nature, in which this type of atrocity was committed. Their reasoning for committing this act of atrocity, was the fact that they did not have the men or vehicles to keep them as P.O.W.’s nor the food to feed them, and further, they would impede their rapid advance so that they could not maintain their schedule. This massacre occurred on 17 December 1944, in a field behind a prominent café, at Baugnez, ‘The Bodware Café’, and it was not until 1 January 1945, that the uneven humps in the ground – the bodies had frozen in grotesque forms, and were covered with 4-6 inches of snow – were discovered to be U.S. soldiers and were found by men of the 120th Infantry of the 30th Division. A few of these men did manage to survive, one of whom was Bill Merriam, and his story, and the story of others, led to several of the Germans being captured later on, having to stand trial at the Nurnburg War Crimes Trial, after the end of the war. A monument has been erected near the site of the massacre, and the name of each soldier that was killed, is inscribed on a plaque along the wall, about 100 feet in length, and the U.S. Flag flies there, day and night. It is well attended by the local citizens, and fresh flowers are laced at the monument by someone, nearly every day, and is one of the most highly visited sites in the area. Memorial services are held here frequently, particularly when veterans’ groups visit the area on Memorial Day and on other special occasions. Later on that same day of the massacre, Col. Peiper’s troops were passing through Ligneuville, they captured 8 more Americans of the 9th Armored Division, and they were executed by a pistol shot in the mouth of each man. A monument is also erected here in their honor and memory. Some of the most intense and viscous fighting of the entire war took place in this area due to the cold weather, lack of warm clothing, food, supplies and ammunition. Temperatures hovered below freezing during the day, windy and with snow falling on many days, and temperatures running as low as –20 degrees at night. During this December – January period, we endured the coldest winter on record up to that time, according to local authorities, and although fighting was severe and continuous, we actually had more casualties from frost bite of the feet and hands, than actual wounds from enemy action. This required an enormous number of replacements continually throughout these two months. The logistics of keeping us supplied with ammunition, food and replacements, was an on-going nightmare for our Service units. In order to assist Col. Peiper in the execution of the Plan, the 3rd Parachute Division was dropped well behind our lines, and they created havoc by cutting phone lines, turning road signs in the wrong directions, and even acting as M.P.’s, and directing traffic in the wrong direction! 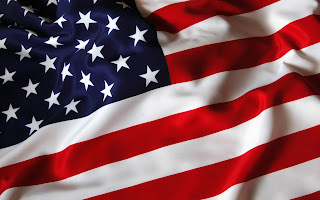 All of the men in this unit were dressed in U.S. uniforms, and by devious means, confiscated many U.S. vehicles, and thereby gave the impression and credence to their being genuine U.S. soldiers, and authorized to be there. Little thought was given to challenging them, “so far behind the front lines”!! Most spoke excellent English, which many of them had learned while living in the United States prior to the war, and they even knew our pass-words of the day, which had been captured during the break-through from the 106th Division. In this area, on the Western outskirts of Malmedy, one of our men, Pfc. 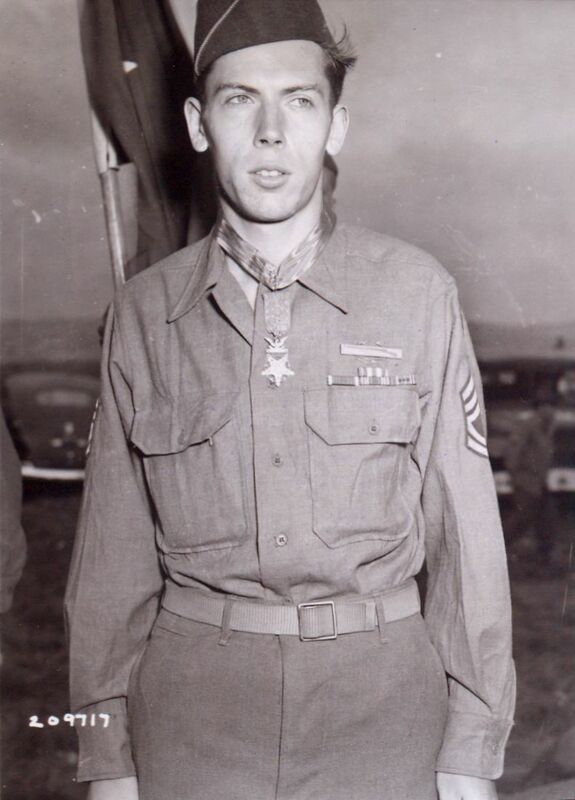 Francis S. Currey, engaged a group of German tanks, a half-track and two anti-tank guns, and he single-handedly, with a B.A.R., a bazooka, anti-tank grenades, a .50 caliber machine gun, mounted in a U.S. half-track that had been knocked out and abandoned earlier, and a .30 caliber heavy machine gun. He knocked out 3 German tanks, one of which had the markings, fake of course, of the U.S. Star on the turret and on the sides of the tank, two half-tracks, killed several German soldiers, and in the midst of all of this, saved the lives of 5 of his comrades from certain death, or of being taken prisoner. For this Francis S. Currey was awarded the Congressional Medal of Honor, and the Belgian equivalent, the Belgian Military Order of Leopold II with Palm. In the meanwhile, the Germans had claimed the capture of Malmedy, and the headlines of the Stars & Stripes proclaimed this! Thus our Air Corps partners, the “9th U.S. Luftwaffe” as we called them, came over with their heavy B-24 bombers on 24 December, and opened their bomb-bay doors directly over Malmedy. Malmedy had been liberated in October 1944, with little or no fighting, as the Germans were on the run at that time, heading for their defenses along the nearby border of Belgium and Germany. So, Malmedy had been spared of any appreciable damage, and when we moved into the town on 18 December, it was a beautiful and picturesque resort town, where everyone was merrily going about their business as usual. This suddenly changed the whole picture! Malmedy was a total disaster, with the entire center of the city laid to waste. Many civilians were killed and wounded, but we were fortunate in losing only a very few men of our own. Our biggest loss was our Christmas dinner, which was being prepared that day. Spam and bread is what we got!! Three of our Company’s kitchens located within the City of Malmedy, were totally destroyed. Of course our Air Corps ‘friends’ apologized, and they still could not understand just what went wrong. As they were apologizing, the 9th Air Corps was on its way, to make sure of the knock-out, and they bombed Malmedy again on Christmas Day! This in spite of the whole city having been covered with our normal phosphorescent panels, to indicate that the area was occupied by our own forces. At this particular time, I was a Liaison Officer from the Division Hq., which was located in the Hotel des Bruyeres in Francorchamps, to the 120th Regimental Hq. which was located in the City Hall in Malmedy. I drove between these two points frequently, day and night, so it was prudent to find the shortest route between these two points. This led me to an unimproved road up over a mountain to the northwest of Malmedy, and through the settlement of Burnenville, situated on the top of the mountain. This route saved me many miles of travel and hours of time. On the fateful day of 24 December, as I was traversing this route, and was about to descend the slope of the mountain down into Malmedy, I heard the drone of planes to my rear. I told my driver to stop right there. We looked back and saw this great flight of B-24 bombers. What a wonderful sight to behold! I said to my driver, “The Germans are going to catch Hell somewhere”, and he agreed. Little did we know at that moment that their target was Malmedy!! In a few moments, we were appalled when we could see the bomb-bays of the planes open, and the bombs began to tumble out!! It was total horror as we watched the bombs drop all the way down to their target, the heart of the City of Malmedy!! Clouds of smoke erupted from this point, then flames reaching hundreds of feet into the air over Malmedy. I had a small camera with me, and I took a few photos of the planes, dropping their bombs, and then of the city shrouded in smoke and flames. It was later learned that three of our 3rd Battalion kitchens had been totally destroyed, and about 25 of our men were missing in action, all presumably in and around the kitchen areas, and no trace of them was ever found. There is some question as to just when this action occurred, as everything and every body was in a state of chaos. Whether this action took place on 24 December or 25 December is questionable, but the fact remains that we WERE bombed on both days. All of the Company’s records were destroyed in these bombings, so all we have is the accounts written in the history books, and the recollection of others many years after the event. We cranked up our Jeep, and raced down the slope of the mountain, and crossed the bridge over the river on the north side of the city. That was as far as we could go, as there was debris from the bombing all over the streets, making them impassable. People were running around screaming for help and needing assistance. Knowing where all of our medical facilities were located in Malmedy, all that I could do was to direct them to the nearest medical facility, where they could get help. Upon reaching the Regimental CP located in the City Hall, I found that all of the phone lines were out, and radio communication with the Division Hq. was not possible due to the distance and the interference of the mountain between the two headquarters. I was delegated to race back to the Division Hq. and advise them of the disaster that had just occurred, and to summon assistance at once. Almost immediately, as many of the Medical officers and staffs were summoned and dispatched to go to Malmedy to render any assistance possible to our own troops first, then to render assistance to the civilian population as needed. Needless to say, the 105th Engr. Bn was dispatched also, to render assistance in clearing the main routes through the city as quickly as possible. It was remarkable to note that, although the entire heart of the city was destroyed, the St. Quirin Cathedral was virtually untouched! Talk about Miracles!! However, we recovered from this disaster rather quickly, as most all of the necessary ground support was almost immediately available, since we were in the midst of the 1st Army supply depots, which had been abandoned by them on 16, 17 & 18 December 1944. In another action, in the small village of Petit-Coo, another of our 30th Division men, T/Sgt. Paul Bolden, earned the Congressional Medal of Honor. He charged a building housing 35 Germans, under the cover of one of his comrades, who was armed only with a rifle. 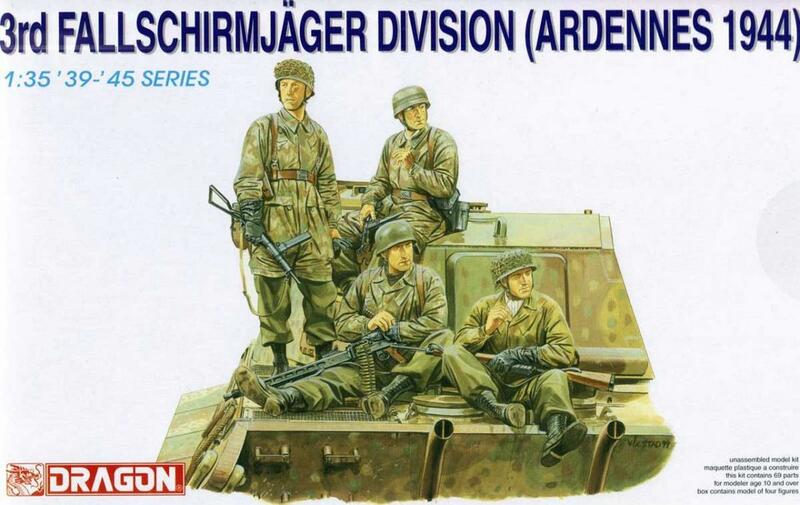 The Germans had pinned down his Company for some time with heavy automatic weapons and small arms fire. His covering comrade was killed by this intense fire, but undaunted, he hurled fragmentation and white phosphorus grenades into the doorway and windows of the house. He received return fire, and was hit by 4 bullets in this action, then, despite his wounds and weakened condition, he charged the house again and sprayed it with a sub-machine gun. He waited for the Germans to come out to surrender, but none came out. Thirty five dead Germans were in the house. None escaped. T/Sgt. Paul Bolden was awarded the Congressional Medal of Honor, which was presented to him by President Harry S. Truman in Washington, DC in September 1945, after returning home with the Division. Many more actions such as these two C.M.H. recipients occurred, but were never adequately documented, so those involved in these incidents were awarded 65 Distinguished Service Crosses, and an untold number of Silver Stars. 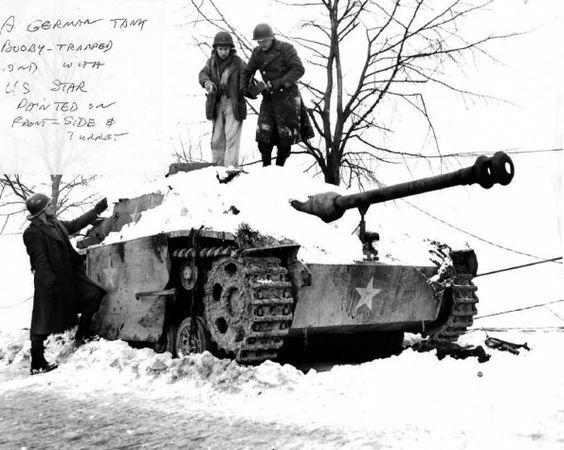 Finally, by the end of January, the “Battle of the Ardennes” had ended, (More commonly called the “Battle of the Bulge), and the front lines were nearly back to where they had been when the attack was first made on 16 December 1944. Hitler’s elite 1st S/S Panzer Division, the Adolph Hitler Leibstandarte, had been totally destroyed, and was never able to reorganize and come back into battle, as it had done before. Around the 1st of February, 1945, our 30th Division was relieved in this area, and we returned to Germany, to nearly the same position that we had left in mid-December, and again prepared to attack over the Roer River. This escapade of Hitler’s, cost us all very dearly! Vous avez surement remarqué que les fabricants de jouets s'emparent des faits d'Armes les plus exceptionnels à des fins pas très patriotiques mais plutôt pécuniairement très rentables. Il en est ainsi avec Francis S. CURREY et son GI JOE. Une autre unité, tout à fait exceptionnelle par ses faits d'armes, est la 3. 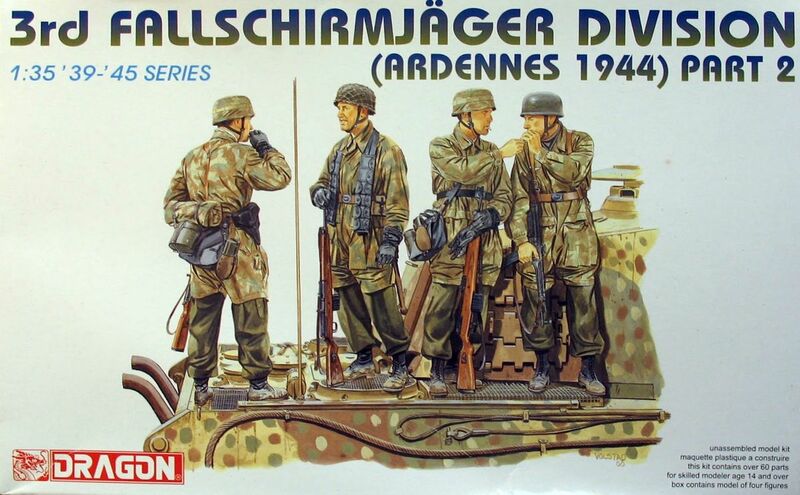 Fallshirmjäger Division. Depuis la Bretagne jusqu'à la Bataille des Ardennes, elle a montré à la fois sa bravoure et sa préparation tactique face à une armée suréquipée qui a dut puiser dans ses plus profondes réserves pour en venir à bout. Et bien une société de jouets (...chinoise) s'est aussi inspirée de la bataille des Ardennes pour créer diverses reproduction de ces combattants (notamment). ou via le site de DRAGON.